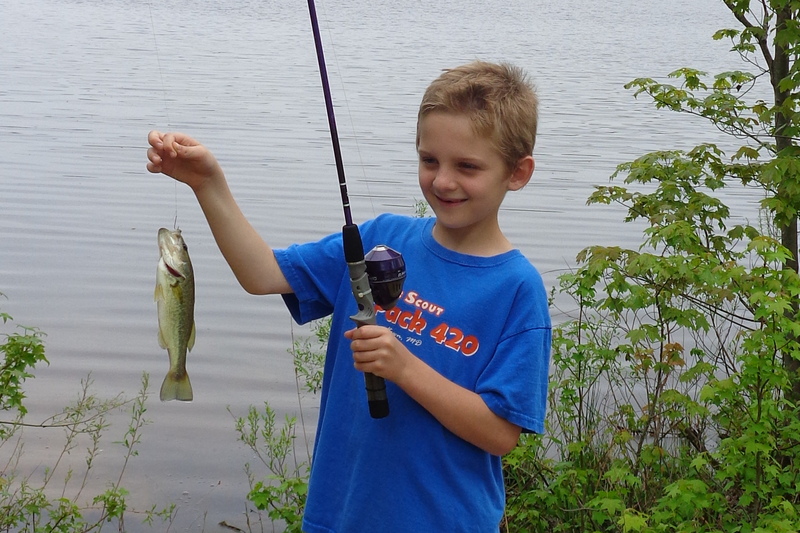 For all folks in Southern Maryland, I wanted to make an unsolicited plug for DNR’s Youth Fishing Rodeo, this year to be held on May 13th, at St. Mary’s River State Park (aka St. Mary’s Lake), 8:30am-12:30pm. The focus is on catch-and-release fishing for youth 15 and younger, but DNR also brings other fun stuff such as info on local ecosystems, a few wild animals (snakes, owls…), giveaways – even loaner fishing equipment for kids that don’t have their own. No licenses are required for the event, and bait is provided – for free – when you check in. Once the fishing clock starts, kids spread out along the lakeshore and try their luck. DNR reps serve as judges and station themselves along the shore. When the kids catch something, they go get it measured and recorded, then set it free and try again. When they get tired of fishing, kids can try their luck at the casting competition (for accuracy at a target), or get some hot dogs and chips that are cooked on site. After a few hours, it’s time for PRIZES, and there are plenty! Most Fish Caught, Largest Caught, Smallest Caught, a prize for the largest in each species caught – bass, bluegill, yellow perch, chain pickerel, a few others… and even if you don’t win these, there are raffle drawings, so that almost every participant walks away with something. Tackle boxes, rods and reels, lures – these prizes are pretty decent! And best of all, IT’S ALL FREE!! You just have to register ahead of time at 301-872-5688. All in all, it’s a great family event, run by really enthusiastic people. A great opportunity to get outside and expose kids to nature. Get Out There and give it a try!